better than i could have imagined: Let's go to the zoo, zoo, zoo! Well....we finally made it to the zoo! And I say finally.....because we have been planning to go for years, I guess....and have just never made it. It was always something.....too hot, too crowded.....and I wanted Geoff to go with us for our first time, too. But today the stars aligned and we are so glad that we were able to go. Like I said- we have always wanted to go.....but as we were there....and did and saw more and more....the more I kept thinking to myself, "We have been missing out!" I was really so impressed with everything. I know I have been to the zoo before, but it has probably been since I was a kid....so 20+ years. Geoff and I had just as much fun, if not more, than the girls! We are seriously considering family passes (some of my friends and sister already has them!). About 5 minutes in, Parker said, "I love the zoo." It was so sweet and sincere. And Grace had her own fun, too. It is a joy to watch both of them...at their different stages in life and literally enjoy the heck out of something, but in totally different ways. Why do I always have to have this long monologue before I get to my actual point??? Grace was not having it. I asked her is she was ready to go to the zoo, and she blatantly said, "No" while shaking her head. We sat at the gorilla habitat for a while. Just kind of in awe of them. So big. So many things that look like us! Their hands....all 4 of them! Ha! Their feet have a thumb instead of a big toe, so they really have like 4 hands. I'm sure you already know this. 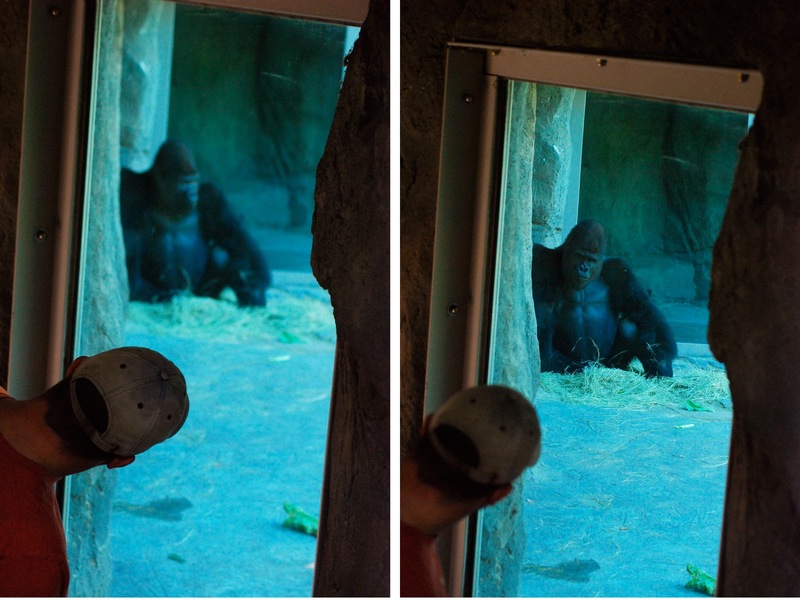 It was as though that gorilla was staring straight through Geoff. Parker had to keep up with the map. Her choice, not ours. At the beginning, she kept trying to move us along to go see the 'flamingos.' Here- she is showing me where they are. I'm not sure if she was making this up or not? We ended up riding the monorail. Not something we'll probably do again, but had to do since it was our first time. Parker was excited to get on.....and minutes later was ready to get off. One walked right up to us. How neat it must have been for Parker to be eye to eye to such a creature. One of the zoo workers let him rub his/her chin (jowl?). Then we watched the lions as we ate. We finally made it to the children's zoo. By this time we were all tired, but nothing that a little water and play time didn't fix for a bit. Luckily I brought a change of clothes.....only because I read that Kristin brought a change of clothes when she went to the zoo last week. Parker did the pony ride. I was so proud of her. She's one that I never know how she'll end up being....she can be excited one minute, and then melting down the next. I did try to sit Grace on the pony....and she told me no. We walked out and I asked her again if she wanted to ride....and again she shook her head and so "no, no." So the last thing we did was ride the carousel. And of course....after the first ride they wanted to ride again. Even Grace was saying, "Uh-gen" and pointing. But we had decided that we were done for the day.....when a man walked up and gave us his 2 extra tickets. He had 2 boys....the oldest rode with us the first time and the youngest decided not to. So the oldest was going to ride again since the younger brother didn't use his ticket the first time....thus leaving the nice couple with 2 extra tickets. So very sweet of them. Definitely want to pay that forward. Parker chose for us to ride in the 'nest'.....reminding me of the tea cups at Disney (although I do not think I have ever ridden the tea cups at Disney). She had the best smile and laugh almost the entire ride. Looking forward to a relaxing day at home tomorrow. Well- maybe not the relaxing part.....we have 2 kids. But will be good to be home since we have been blowing and going for the past 2 days.....which has also been nice, but good to be home. I am glad you had a great first trip to the zoo. I think the passes are a must! Looks like loads of fun was had by all. Proud of Parker for riding the pony too!